ASEAN-Japan Centre conducted a school-visit to Oto Elementary School. 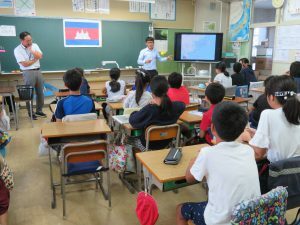 In the school-visit program, Cambodian, Myanmarese, Vietnamese nationals living in Japan introduced their home countries to the 6th grade students. 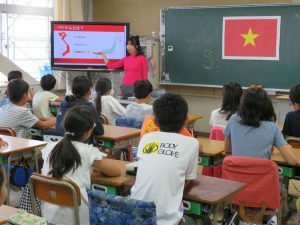 Since the school is selected as a Model English Education Research & Development School of Saitama-city, a part of the class was conducted in English. Students eagerly listened to the lecture on foreign culture and tradition. As the students had done some research on the three countries in advance, lectures went smoothly and the lecturers and students enjoyed the discussions on topics such as geography, food, and language of each country.